The PDS Ring-Moon Systems Node archives and distributes Cassini remote sensing data sets (CIRS, ISS, UVIS, VIMS, and Radio Science ring occultations). Use OPUS to search for specific Cassini data products using a wide range of criteria including enhanced geometric metadata produced at the Rings node. The enhanced geometric metadata includes information appropriate to planet and satellite searches as well as enhanced ring geometry. Supports CIRS (limited), ISS, UVIS, and VIMS. Search results include data files, tables of associated metadata, and browse thumbnails for each image. User selected data files can be bundled as tar.gz files for easy downloading. The first Cassini data release was on July 1, 2005 with subsequent data releases at three month intervals. The last scheduled mission data release was in early July, 2018. During FY18, while the team was preparing the data for releases following the spacecraft’s plunge into the atmosphere of Saturn, they, in conjunction with the PDS, also began the task of organizing supplemental documentation and in some cases derived products from the mission. The RMS Node will be the curating PDS Node for all such documents and products produced by the Cassini Rings Working Group. 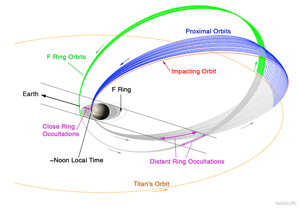 Projected additional datasets include occultation data sets for the entire mission from RSS, UVIS, and VIMS; a data set of ISS mosaics of the F-Ring; separate ISS radial profiles of the bright and faint rings of Saturn; a data set of ISS high resolution rings images with radial structure subtracted; and a data set of VIMS reflectance spectra of the rings. Projected documentation includes substantial sets of observation planning information for all of the rings observations. PDS Subscription Service, and through announcements in PEN. Cassini data is curated at five different PDS Nodes. The lead node for the mission is the Atmospheres Node which maintains an omnibus set of Cassini Archiving web pages. These contain a wealth of supplemental information for understanding Cassini and the observations and are updated as new material becomes available. Master Schedule (updated 7/24/17). This is an “as-planned” listing of observations spanning the interval from May 14, 2004 to July 9, 2017. The list contains 61,874 entries and may be downloaded and sliced and diced to make your own listing. The tabs associated with this page. The tabs associated with this page describe the Cassini instruments and data relevant to planetary ring studies, provide access to the data, and links to sites within and outside the PDS likely to be of use. Links to supplemental information and Users Guides developed to improve the search and ease of use of Cassini data. Instruments and Data - Information and data by instrument. RSS: occultations. Raw RSS data may be obtained from the PDS Atmospheres Node. UVIS: raw images, occultations & spectra, plus calibration files. VIMS: raw images, occultations & spectra, plus calibration files. Cassini Links - Links web pages and resources outside the Ring-Moon Systems Node. CDAP - Our support page for the current ROSES Cassini Data Analysis Program (C.10)including links to Cassini data at other PDS Nodes. CDAP26 - Our support page for the supplemental ROSES Cassini Data Analysis Program (C.26) including links to Cassini data at other PDS Nodes.